One of the great things about dried beans is that they have a long shelf life … and they’re certainly not something we worry about wasting. But, it looks like we’ll be making an international move later this year — and that means trying to use up pantry items that won’t make the move, and that we aren’t likely to be able to donate or give away. 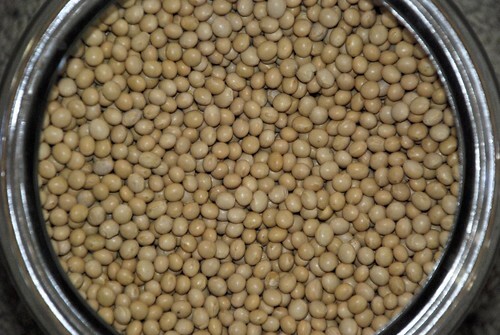 Like the soybeans … which we buy 25 pounds at a time. So, for the past couple of weeks, we’ve been trying to figure out new ways to use the beans (aside from tofu and soy milk), with varying degrees of success. These are some of the recent attempts. 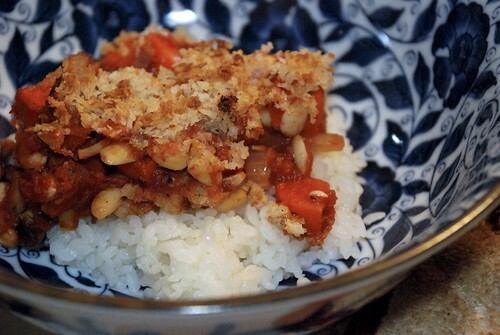 I’ve never cooked with just plain soybeans, and so went hunting for recipes online, and found this recipe for a soybean casserole, which I adapted with the veg we had on hand. This was a definite win, and the roux added a nice depth. Instead of using milk in the batter for this pancake, I used a banana-soy smoothie (1 cup soy milk & 1 banana) which I soured with a tablespoon of vinegar — and instead of egg, I used a heaping tablespoon of okara. Along with that were the usual suspects (1 cup flour, 1 tablespoon sugar, 1 teaspoon baking powder, 1/2 teaspoon baking soda, 1/2 teaspoon salt, 1 tablespoon melted butter). ‘Twas nice and fluffy. This entry was posted in On food waste, Waste less recipes and tagged okara, recipe, soy, soy beans, soy milk, soy pulp by Jean-François. Bookmark the permalink. 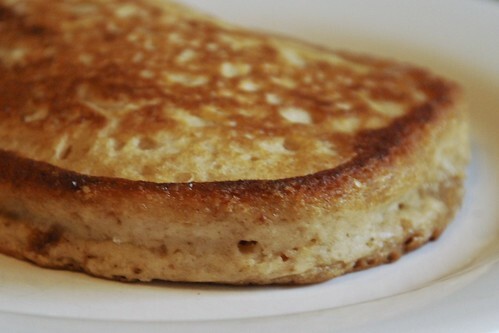 My go-to pancakes are best with soy buttermilk (a bit of vinegar added); light and fluffy with no oil or egg either. (Take that, Mee-Maw!) 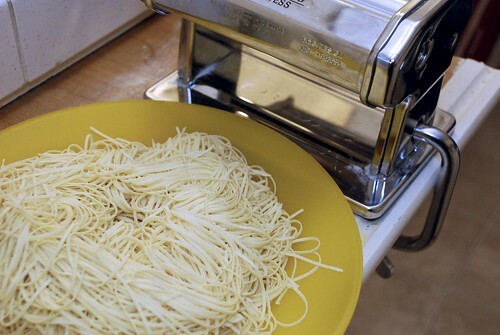 We are making a batch more than once a week, though we are not up to a 25-lb single bulk purchase yet! You are brave to try noodles with okara. I don’t have time for failure, though; successes ONLY in my kitchen after my year from hell getting there. I still owe it to you to our current soy milk making habit; loving that tofu book too. Hi Shannon — wonderful to hear from you! Things here in BC are great (except for that drought that followed us from LA). The good news is that Richmond composts (so we don’t have to fight that battle here). And I think of you and your family whenever we head to our local bird sanctuary. We saw some stunning sandhill cranes on the last visit (ref: https://www.flickr.com/photos/jfchenier/). Loved the photo share…thanks! Many changes over here: kids came home for virtual public school, many birding excursions, busy summer. We enjoyed a half-million roosting martins last night. Life is certainly meant to be lived, not blogged, but COME BACK! Glad you are all settled in BC. We might be closer neighbors one day soon. OK, so I am slow on the responses… but “closer neighbours one day soon”? No fair teasing like that. You guys planning to move north? I love soybeans, especially soya milk!